In addition to being a classic Cape May vacation home in the perfect location, the Longfellow Guest House also can deliver real and significant value in terms of dollars saved on your vacation or event. And these days, where every little bit counts, we thought we'd expand that idea to help in your research, or when comparing our home to other accommodations. When comparing the value of our guest house compared to other accommodation options, be sure you understand the total value of the entire rental experience. Many times there can be extra costs that add up. Or, inconveniences that don't become apparent until you're already here. For example, if you select a home that is far from the beach or to town, every time you want to experience the beach or town, you may even have to drive. Now that's not good or bad per se, it depends on your goals, but it's important to consider when researching..
Another key point is the bed count in each room. Many guest houses set their rates based on the total headcount they can accommodate. Makes sense, right? But if you look closely, some places simply cram in additional beds to rooms so they can increase the total rental rate. Imagine having 4 people in a room that really should only accommodate a couple. That's not fun and so make sure you understand room configurations, if that's important for your group. 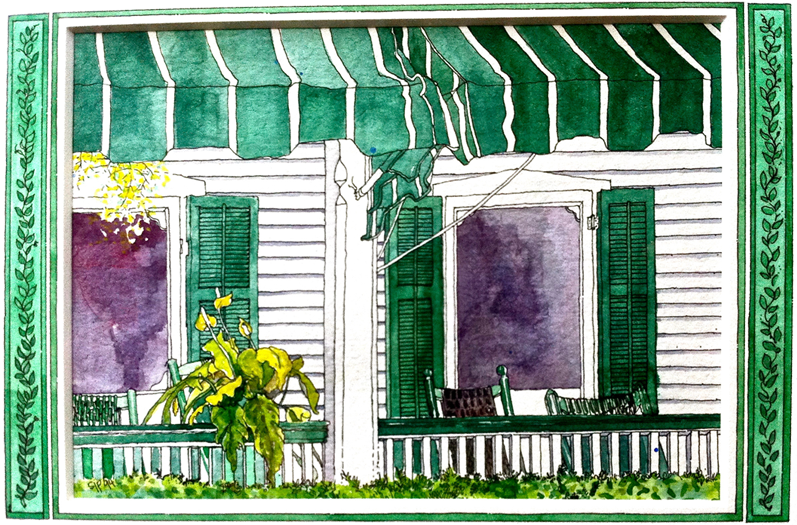 Another Sue Petticord original watercolor of our front porch that overlooks Hughes Street. Hanging out on the front porch after a long day at the beach is a favorite memory growing up. You really get to take in the quiet beauty of old Cape May while catching up with friends and family. Location: We've reiterated throughout this website how our great location is, because we know that can be a key feature for families or for group retreats that want to be close to best of what Cape May has to offer. When you can comfortably walk or ride your bike to just about anywhere, that's a big big plus and for many of our guests there's little need to use their car during their stay. Everything is right there in the neighborhood! Lower costs per person: Staying in a large house is a super way to reduce costs for a given stay. If you break down the cost person person, that can provide a clear metric for comparing against other accommodation options, so you're comparing apples to apples. To determine cost per person, simply divide the total rental cost by the total number of people in your group, and then divide that by the amount of nights you're here. For example, if there's 12 in your party, and you take an off-season weekly rental with us for $2,450, the cost per person is $2,450 divided by 12 people, divided by 7 nights equals slightly under $30 per night, per person. That's a great value! On-Site Parking: Our 3 private parking spots are convenient and save money. Many rental homes do not provide private on-site parking. And if you add up the cost for off-site parking (for the house and beach) for the week, it could literally add hundreds to your vacation cost. Not to mention, it would be a total hassle to find parking when it's busy. And by busy, we mean during the entire summer season and many of the popular Spring and Fall weekends. Beach Chairs: We also provide comfortable beach chairs (usually 5 or so) for our guests and a convenient on-the-beach box to store them. Renting a beach chair can cost about $7 a day each, and the beach boxes - if you can even find one available for rent - can be quite expensive. We provide both which makes for a valuable cost savings and a hassle free beach routine. Beach Tags: Your rental includes access to 10 beach tags which is a considerable savings. Broadband Access: We also provide broadband wireless internet access for our house. The local internet cafe charges up to $7 for 15 minutes to go online, and many of the hotels add a service fee for their guests for online access. Our broadband wireless access comes with your rental, and the best part? Well, there's really no better way to log in to the office than by sitting on our front porch with a perfectly mottled mohito watching the horse and carriage tours clip clop by as the sun sets. Here's something else to consider, and though it might sound a little softer in terms of dollars saved, many of our guests have told us this is the most important part of staying in our guest house. In a guest house, families (or groups, if you're on a retreat) tend to enjoy their time together more. So you end up spending less on outside food & entertainment (if you choose), because it's easier and more fun to bar-b-que and hang out with your friends and family here! The kitchen accommodates cooking large family meals and you can eat in, which is much less expensive than eating out. A lot less. And truth be told, it's a much more enriching and memorable experience to put together a fun and delicious bar-b-que on the back deck and to hang out with family and friends. It can make the entire vacation experience that much more memorable and enjoyable and those are the details you and your children will remember years from now. 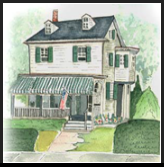 If you still have questions about the value of a vacation house rental, about our guest house, or about Cape May in general, just click the Contact button at the bottom of the page. Ask us anything and we'll get right back to you.